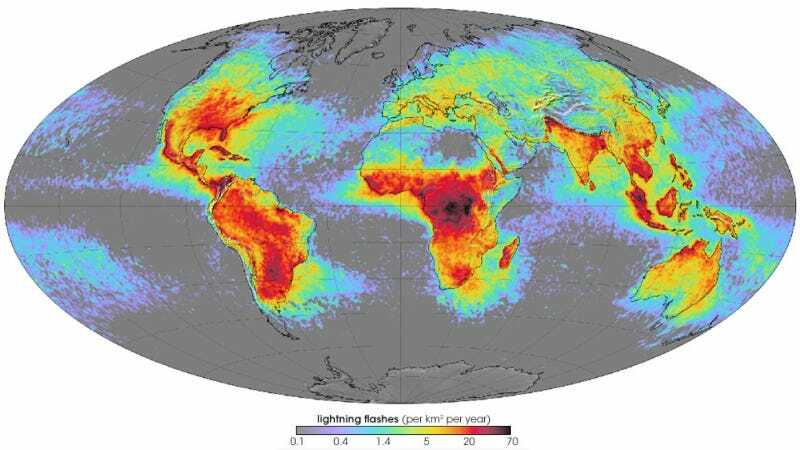 In this map, created using NASA satellite data, you can see in lurid detail where lightning struck Earth the most between 1995-2002. This historical information can give scientists clues about where it's likely to strike again. And with tornado, monsoon, and hurricane seasons getting underway, you too might want to know where these ultra-hot bolts of electricity will slam out of the clouds. Here are some of the most up-to-date lightning maps. NASA also has a map of lightning strikes that's regularly updated, showing lightning strikes from 1998 to the present. The more up-to-date map is very similar to what you see above, except that it shows more intense activity in Argentina and South Africa. Also, according to NASA, the greatest amount of lightning strikes are near the Catatumbo River in Venezuela (where there are 40,000 strikes every night, for most of the year), and a mountain town called Kifuka in the Democratic Republic of the Congo. You can see the dark regions signaling thousands of lightning strikes over these areas in the map above. Over at the University of Washington in Seattle, Earth scientist Robert Holzworth is running an ongoing project to collect lighting strike data all over the globe. Using sensors all over the world, Holzworth and his colleagues analyze very low frequency (VLF) waves in the radio spectrum emitted by lightning. He creates maps and animated gifs showing the distribution of lightning in various areas, revealing where lightning is striking the most over time. The upshot? Warmer areas over land tend to attract the most lightning. And the patterns seem to be quite predictable, so it's fairly easy to plan trips to avoid areas where you might incur the wrath of Zeus. Of course, as the climate warms up over the next century, these maps may reveal a very different set of patterns.